Despite all the global headlines, the SPX has remained trading in an extremely tight range. Close to close the index has traded in a 0.15% range over past days. Imploding volatility can be used, all depending on your view. We have had several questions with regards to options and trading options recently. Below is a good brush up reads for the slightly “rusty” investor. A derivative is a security where the price of the derivative contract depends on one or more underlying assets. The value is determined on the fluctuations of the underlying asset. Derivatives are used for commodities, currencies, stocks and other assets. There are natural users of derivatives; for example corporations hedging their risk in oil price fluctuations, financial institutions designing a specific hedgingexposure in order to match liabilities or a farmer wishing to lock in a specific price for his products. There are also non natural users, that use derivatives in order to speculate in how the price will move of a certain underlying. There are several forms of derivatives such as; futures, options, swaps etc. A futures contract (a derivative) is a legal agreement to buy or sell an asset at a predetermined price at a specified time (time is decided now) in the future. There are futures contracts on equities, indices, commodities, currencies etc. Delivery and payment of the contract is known as the delivery date. An option is a derivative representing a contract sold by one counterpart (writer, also called short the contract) to another counterpart (holder, also called long the contract). The buyer has the right, but not the obligation to use the option (buy or sell the underlying, depending if the option is a call or put contract). The price where the option holder can buy or sell the asset is called the exercise price. Options are valid for a certain time period, the exercise date. On the exercise date, the option either finishes with a value or expires worthless. A call option gives the buyer the right to buy an asset at the strike price at a given point in time. The seller of a call option enters a binding contract where he/she must sell the asset at the strike price. A call option increases as the underlying asset increases in value. A put option is basically the inverse of the call option; hence a buyer of a put option has the right to sell an asset at the strike price at a given point in time. Options are traded either as standardized contracts cleared by an exchange, as well as they trade as OTCproducts (over the counter, i.e. not cleared by an exchange). There are options on most financial assets. Options values depend on; current stock price, intrinsic value, time to expiration, volatility, interest rateand dividends. There are various models when it comes to valuing options, with the Black and Scholesbeing the most well known. Options risks are referred to as the greeks. Below is a payoff chart of the 4 basic options positions, often referred to hockey sticks. A trader long a call option (upper left), limited downside (premium you paid) and unlimited upside. The long put option (lower left). Note the long put option position has almost unlimited upside (an asset can’t go below zero). Note the inverse is valid if you are short the options; upper right shows short call, lower right shows short put. Delta of an option measures option sensitivity to a change in the price of the underlying. Delta is most likely the first risk parameter encountered by a trader of outright positions. Below a chart showing delta of a call and a put option. Note the relationship of delta in relation to moneyness of an option. The further away from where the spot is trading the lower the delta (delta approaching zero). The more the option is in the money (ITM) the more the option will behave as the underlying itself (delta approaching 1). Gamma measures the rate of change of the delta, the first derivative of the delta. Gamma is lowest for deep in or out of the money options and is consequently highest at the money. If you are long an option you are long gamma, if you are short options you are short gamma. One can say the delta of an option is its speed while gamma is its acceleration. Gamma for at the money options explodes as the option nears expiration. Theta of an option is the time decay of the option. Traders often refer to theta bleed which is the value an option loses every day. Buyers of options will have a negative theta while writers of options will have positive theta. The effect of theta on options increases as the option nears the expiry day and trades close to the strike price. Below is a chart showing theta. Theta accelerates as the option nears expiry. Volatility is a central concept in trading options. Historical volatility is the annualized standard deviation of past asset price movements. It measures the daily price changes in the asset over the past year. In contrast, implied volatility is derived from an option’s price and shows what the market implies about the stock’s volatility in the future. Professional options traders trade volatility as an asset itself. Retail clients on the other hand, usually use options to play directional plays and think in terms of premium, as opposed to volatility. Implied volatility of an option can rise or fall without the underlying asset moving. The image below is showing how a typical options screen looks on a real traders screen. The strike price, maturity etc is seen, also note the columns implied volatility and the theoretic price of the option. The implied volatility is the unknown input for an option from which the theoretical price is derived from. A volatility trader trades the volatility and doesn’t really care about the premium of the option. Below is a typical volatility curve for a stock as shown on a professional traders screen. Note the smile that is often present in various assets showing how volatility varies for strikes further away from at the money (ATM). Below chart shows how profit and loss varies for a long call option holder as the implied volatility changes. One example where novice traders many times get frustrated is that they buy options pre earnings of a specific company. Let’s assume a trader buys a call option and the stock moves higher post earnings but the option actually loses value (despite the stock actually trading higher). This is a classical example where implied volatility of the option decreases post earnings. Ceteris paribus, the uncertainty post earnings is gone, hence the fall in implied volatility. The next image is showing the typical move in volatility for a stock going into earnings shortly. Implied volatility tends to rise as we approach the day of earnings. The curve shifts higher, and many times the wings (out of the money options) get an even higher rise in terms of percentage increase of implied volatility. What many retail/novice traders experience is that they get the earnings day move right but they still manage losing money. This effect is best explained by the next image. Note the sharp decline lower in implied volatility. The uncertainty is gone with regards how the earnings of the company will be, hence the move lower in volatility. 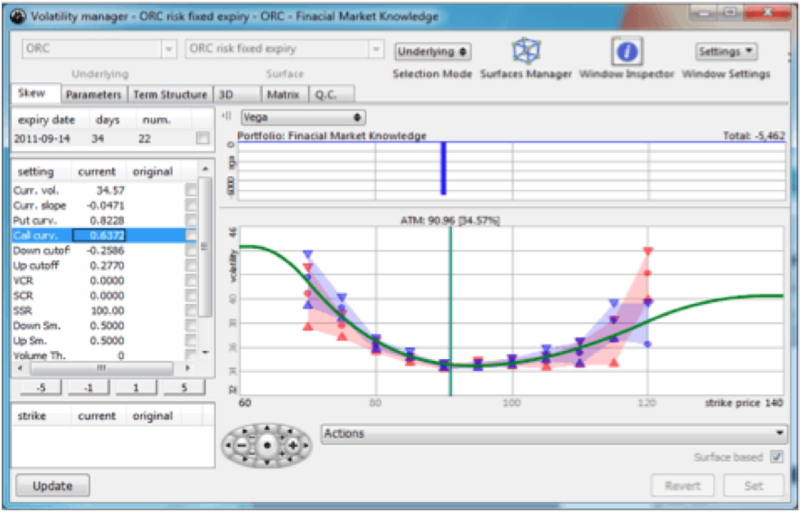 Skew is a concept in options trading. Skew is the phenomenon where options on the same underlying and maturity, but with different strike prices, trade with different implied volatilities. Depending on being in the money, at the money or out of the money, options will trade with different implied volatilities. Skew (and the constant change in skew) is primarily an effect of supply and demand. Generally speaking, fund managers tend to buy downside protection in stocks and indexes, hence making demand for puts big and therefore pushing implied volatility higher. The inverse is valid for upside calls, where fund managers many times write calls on their underlying, therefore supplying the market with calls and therefore pushing call volatility lower. Below image shows a typical skew for a stock/index. Term structure of volatility is the curve showing different volatilities for different maturities. The term structure is curved due to the fact that options with shorter time maturities change faster than options with longer time maturities. Depending on market conditions, events, earnings, supply/demand the entire curve shifts up and down, as well as the curvature itself. For example in a market crash term structure tends to go very steep due to the fact implied volatility of short term options become violent. Below is a chart showing the term structure of SPX and SX5E. Note one is trading in backwardation (higher vols for shorter maturities, usually the looks in a market sell off) and the other in contango (shorter term options trade with lower volatility, usually the normal look). Dynamic delta hedging, option expiry trading and pin risk/opportunity creates interesting dynamics for the underlying asset and affects traders and their positions. As an option nears expiration it will become increasingly more probable of being in or out of the money. An option can only be worth or worthless when expired. Traders at hedge funds and banks trade options as volatility mostly, hence these traders hedge their options positions with buying or selling the underlying asset. This is called delta hedging. When an option trade is initiated with a delta neutral strategy (assume a call option), the trader will buy a call option and sell the equivalent amount of delta hedge. Depending on the delta of the option, the corresponding amount of shares, or other underlying asset, will be sold. Hence, the delta neutral trader will be long a call option and short the stock. This combination is also called to be long a synthetic put. When the stock falls the option becomes less worth and the delta (probability of the option being in the money at expiry) falls. This creates the dynamic whereby the trader now has an option with much less delta than before and a position with short stocks. Let’s assume the company profit warns and the stock price falls sharply. Then the call option will be very close to worthless and the trader is just short stock. The short stock position will produce gains, while the value of the call option is the loss. Depending on the magnitude of the move of the stock, the p/l will be affected. The delta neutral delta trader with long options positions wants big moves because the loss of the option will be offset by the short stock position in our example. The trader is long gamma. In the most extreme example let’s assume the stock goes from 100 to 1, the call option obviously is worth zero, but the trader’s short stock position will contribute to large p/l gains. In most cases the delta hedged trader adjusts the delta more often and with smaller moves than the above described. Say the trader is long the call and short the stock and we have a normal move lower (assume the stock falls from 100 to 90). The optionality of the option makes the call less worth and the delta is smaller. In order to keep a hedged (balanced) position the trader needs to buy back some of the short stock in order to balance the portfolio and make it delta neutral again. Let’s assume the stock bounces higher and trades at 100 again. The trader has in this case bought extra shares at 95 that have gone up in value by 5. If the move happened in a short time period the call option will be practically worth the same, assuming no/minimal theta decay. The trader will end up with a positive overall p/l. What happens if the stock continues even higher and trades at 110 the day after? The trader will now have an even bigger gain from the shares bought at 95 (unless he sold out the hedge), as well as the call option now trading at a higher price as optionality of the option starts kicking in. The delta of the option increases and so does the need to sell extra shares to delta neutralize the position. The trader will have the bonus shares bought at 95 as a gain, the call option itself will be worth more and the position will need additional shares to be sold in order to balance the portfolio. Let’s assume the trader sells the delta needed to hedge the portfolio and immediately after the shares go lower and trade at 90. The trader will once again end up with a call option that has decreased in value and who’s optionality has decreased, the delta is going to be much lower again, requiring the trader to buy more shares in order to make the position delta neutral again. This time the trader will have even more short shares, remember the need to sell more shares at 110 when the option delta increased, plus the bonusshares bought at 95 when the stock fell first time. The above explained procedure is called dynamic delta hedging and is primarily used by traders that trade volatility as an asset. In the example above I explain the trader that is long an option. The same applies to the trader that is short an option and dynamically hedges the position, but it will be the inverted dynamic to the long option trader. The long premium trader wants large moves as he/she is long gamma. The short premium trader wants the stock to be as non volatile as possible since he/she is short gamma. What happens at option expiry? Let’s assume the above example but where the trading takes place on the last day of the option, the expiry day. The trader is long the 100 call, the stock trades at 105, the portfolio is hedged and it is the last day of trading. The stock for some reason quickly falls to 95. The trader will be long a call option that will go from being in the money and behaving like the underlying stock (delta 1) to being worth zero and having a delta of practically zero. The trader is then just short the shares and can buy all the short shares at 95. Let’s then assume the stock climbs higher and trades at 105 an hour later. The option will suddenly be in the money, worth the intrinsic value (and a bit more) and will once again have a delta of 1 and will behave like the stock. The trader will now be long again and can neutralize the position by selling shares again. Assume the stock suddenly falls below the strike 100 and trades yet again at 95. The option will more or less digitally go from delta one to delta zero as the stock falls below the strike. All optionality is gone (delta zero) and the trader will be left with a short stock position again. In order to neutralize the risk, the trader needs to buy all short shares again. The dynamic of the option expiry is rather clear! The trader long the strike will trade this expiry opportunity and if the stock moves above and below the strike many times the profit becomes very big. The trader short the strike will experience the inverse dynamic and will not want the stock to move through the strike. This is called pin risk/opportunity. It is advisable to check the open interest on expiry dates as it can give additional information of the dynamics around specific strikes. Depending on the dynamics and who is long/short the strike on expiry, the underlying can experience vacuum moves. The expiration trading pin situations can be compared to a poker game. If one trader knows the big part of the open balance is in his/her portfolio, the trader will know that other traders will need to buy/sell the stock when it moves through the strike. It then becomes a chicken race. Do you hedge or not hedge as you know there is an opposite position that needs to be rebalanced? Surely it sounds great to be long the strike on expiry day as it creates opportunity to buy and sell shares above/below the strike, but as we all know there aren’t any free lunches. The flip side to the coin being long the strike is the exponential cost of holding the option into expiration. Theta decay explodes as the option nears expiration and is the biggest at the money. The optionality decreases rapidly, hence the extreme theta bleed for at the money options. The inverse is of course valid for the trader having sold short the option into expiry. If nothing happens the short premium trader will produce big returns. Possibly interesting trades around expiration is to own teenie options. These are basically lottery tickets that can produce very big returns should unexpected moves occur. Be aware of important earnings results, economic events or other interesting information around expiration days, these can move the markets a lot and make options go from practically worthless to becoming worth a fortune in a matter of minutes. One wise rule is to not be short teenie options. Always close out short low premium options due to the possibility of unexpected events ruining your portfolio. Many traders have been totally wiped out by not paying attention to the portfolio containing short low premium options going into expiration. Structured products (market-linked investing), is a packaged investment strategy based on a single stock, a basket of stocks, options, indices, currencies, commodities etc. There is no single definition of a structured product. These products are often designed for specific needs. Structured products are often complex instruments and are hard for a retail client to replicate. A contract for difference (CFD) is a contract between an investor and the bank/spread-betting firm to pay each other the change in the price of an underlying asset. CFDs are traded on margin and the leveraging effect increases the risk in the instrument significantly. The spread between bid/offer prices are higher than the underlying. Below table shows the cost of buying, 1000 shares of a company X at 2.50 eur, with CFD versus a normal stock trade. The trade with the CFD requires 125 euros while the normal stock trade requires 2500 euros. This is called leverage or trading on margin. An exchange-traded fund (ETF) is basically a fund traded on the exchange. The ETF holds financial assets such as stocks, commodities, or bonds. An index ETF for example based on the underlying shares of that index. In normal situations the ETF trades with an arbitrage relationship to the underlying index making the ETF trade close to the net asset value. Deviations can occur in specific situations, for example if there is a shortage of stock borrows in one stock. ETFs have grown in popularity for several reasons. Low transaction fees, low index tracking costs, more specific exposure are some of the reasons for the increased popularity of this instrument over the past years. There is a wide range of leveraged ETFs. These should be used for relatively short-term trades as the structure of the ETFs carries a high cost for the holder of the ETF. Binary options, a form of exotic options, are fast and actually simple financial products where the speculator bet on the price of an asset rising or falling. Time span is often very short term. Binary options have rather skewed risk profile, that is actually easily understood, but people get excited about possibilities of winning big and they don’t focus on the skewed odds. Despite the trades often being relatively small, they all add up, often leaving the speculator with losses. The game of trading binary options can become rather addictive as there are so many possibilities for short term trading and you always know what you can lose. Don’t forget that the house (the binary options broker) has an edge. Assume the broker pays out 70%, you will need to win 58.8% of the time to break even. Even if you assume 90% pay out, you will need to win 52.6% of time to break even. Recently there has been several bans with regards to binary options and several brokers have been exposed as fraudulent/scams, especially brokers from Israel. Financial risk management is the practice of using financial instruments to manage risk exposure. There are various exposures to risk such as; operational risk, credit risk, market risk, liquidity risk, fx risk, volatility risk, sector risk etc. Risk management identifies, measures and addresses these risks. It is important to focus on relevant risks when it comes to investing and trading. A portfolio manager usually focuses on multiple stocks in a portfolio that can consist of several hundred stocks, while a private trader might be involved in a few names. Irrespective of how many instrument one trades or how complex they are, it is vital to properly identify the risks and hopefully understand the instruments and the risks involved. VaR (value at risk) is probably the most well known risk management measurement. It is used by most portfolio managers and it estimates how much an investment might lose given X probability, in normal market conditions, in a set time period such as a day. While risk management focuses on various risks mentioned above, money management focuses on the practical aspects of managing your money. Risk management would for example identify the risks of a trade, while money management would focus on how much money would you risk on a trade in a given stock etc. Money management is often neglected but is a crucial part of trading. Money management focuses on aspects such as; volatility based stop losses, what is maximum position in a stock as a percentage of your portfolio, adding to winning trades, adjusting position size etc. For more reading on risk management please read our in depth piece called Risk and p/l management where we discuss risk, money and p/l management and give you practical tools to manage your portfolio. Commodity hedges – potential movements in a specific commodity that can affect your investment. Credit risk – risk versus your counterpart not paying back what is owed. Currency risk – risk of not obtaining the outcome due to currency fluctuations. Interest rate risk – risk from the interest rate moving. Equity risk – risk of your stock investment getting affected by the general market risk. Volatility risk – potential risk in volatility affecting your investment. One popular hedging tool is to use VIX futures in order to hedge equity volatility risk. There are of course many more risks to consider hedging, but the above show a few areas where hedging could be used to manage your risk. Important for all hedging is to understand the instrument you are using to hedge your exposure especially when it comes to options. Options are affected by many factors and change characteristics with time, volatility etc. Delta hedging is a concept among options traders referring to the strategy of hedging the risk of price movements of the underlying. Delta hedging is usually conducted with buying or selling the underlying, practically rebalancing the portfolio exposure for price risk movements. Using options in your trading/investing is basically adding an additional dimension to your risk trading. Being long or short is a two dimensional game, while using option gives it a third dimension. Professional volatility trading is an area best suited for hedge funds and prop desks as it requires sophisticated systems/risk management tools and is capital intensive, but there are various strategies involving the use of options to enhance portfolio payoffs even for the less sophisticated user. The covered call is created by selling a call against a long underlying position. The purpose is to enhanceportfolio performance by cutting profit opportunities to the upside as you receive premium for the sold call. You need to be prepared to sell the underlying should the stock close above the strike price you decide to sell. Preferably this strategy is done when volatility is high as the premium you receive will be bigger. The covered call strategy is best suited for the investor who believes in a relatively boring or slightly falling market. Covered strangle is created by selling a call and a put against a long underlying. The strategy enhances portfolio performance if the stock stays between the strikes. The trader needs to be prepared to sell the underlying if exercised on upside and must be prepared to buy more underlying if exercised on downside. Since the trader sells premium the strategy is best done if volatility levels are high! Fairly boring market with falling volatility is best suited for the covered strangle strategy. The covered ratio spread is established by buying a call on one strike and selling the double amount of call options on a higher strike. You also need to be long/buy the underlying. The covered ratio spread benefits if the underlying stays in a specific price interval at expiry. There are many options strategies to use in order to enhance portfolio performance. Investors are many times not viewing their portfolio in a dynamic way and focus on being either long or short. Most investors have views of a stock reaching a specific level, but they fail to use options in order to dynamically adjust their risk according to their views. What do you do if you want to take profit but stay long? You can sell your stock, and use a small portion of the profit to buy calls. Should the stock go down you will only lose the premium you paid for the calls. Should the stock continue higher the long calls position will start to produce leverage and the investor will once again be long the underlying. Another example of staying long but using options is; assume the investor is long 2000 shares and the stock reaches the price target (the investor doesn’t want to sell all stocks here). The trader can sell 1000 shares, buy 10 upside calls and sell (short) 10 downside puts. The buying of the call is financed by selling of the put (depending on preference you will need to choose the strikes yourself). If the stock goes lower you will get to buy the 1000 shares you sold at the strike price of the put you sold short. You will in this case get to buy the stock lower than where you sold it. Note, you will lose the call premium as the stock goes lower, but you are still much better of than having not done anything. If the stock goes higher you will become long again as the call leverage will start kicking in. Note the call premium paid will be financed by the selling of the put. The above simple example is a much more dynamic way of thinking about your portfolio than simply just holding your stocks and not adjusting the risk in accordance to your views. The bull spread is constructed by buying one call option and selling a higher strike option of the same type. It always has limited risk and usually the premium paid for the spread is the cost for the strategy. The profit is limited to a maximum profit = strike difference – premium paid. The bull spread benefits from a rising market. Pay off with a bull spread. The inverse to the bull spread above is the bear spread. It has similar characteristics but with the preference of a view of a falling market. Pay off with a bear spread. Ratio spreads involve buying the option of one strike and selling twice or more options of another strike. The strategy can be conducted in calls or puts and can be constructed for a view of the market moving up or down. Note that the risk is unlimited as you will end up net short options. Below is an example of a ratio spread. Buy 90-call @ 4 and sell the twice the amount of the 95-call @ 2. Premium paid is 0! The above strategy as an image with payoffs and risks involved. In a back spread the trader sells one option and buys two options (of the same type) on another strike. It can be done using calls or puts and can be constructed for up/downside preference. It is a relatively cheap way to get exposure for big market moves.